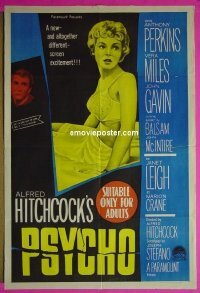 Important Added Info: Note that we are selling a rare alternate style Psycho Australian one-sheet elsewhere on eBay this week. Condition: very good. 5" of separation and tearing along the right end of the middle horizontal foldline as well as 5" of separation and tearing along the right of the top horizontal foldline (both repaired with tape from the back); tiny tears and creases around the edges of the poster (some repaired with tape from the back); tiny stain in the upper left between the "re" in "different" in the tagline area; The above makes the poster sound worse than it actually is! The defects are basically confined to the edges of the poster and I imagine they would pretty much vanish if one decided to linenback the poster.